The unity candle represents your new life as one inseparable couple. Lighting the unity candle together is symbolic of joining your lives. Each of you begins with a taper candle that represents you as an individual. The unity candle (usually a large pillar candle) represents your new life together. Together you light the unity candle, symbolizing the joining of your lives. Just as it is impossible to split the flame, so your two lives are joined into one. The unity candles available in stores range from simple to ornate. Jamie and John, for example, had a simple white pillar candle with a pretty bow around it. Manilyn and Jonathan had a unity candle with a cross and the verse from the Bible that begins "Love is patient and kind; love is not jealous or boastful...."
"What if the Unity Candle Goes Out During the Ceremony?" Don't panic! Taking such minor details in stride and keeping them minor is one thing that separates me from other wedding officiants. If any of your wedding candles goes out I have already prepared a way to use it as a positive message, adding to your ceremony. What Do We Do with the Unity Candle After the Ceremony? If a reception is to follow the ceremony, the unity candle is usually moved to the head table. Most couples give the unity candle a place of honor in their home, such as in an étagère or on their mantle. 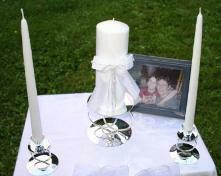 Lighting the unity candle on each anniversary has become a tradition for most couples. Your unity candle ceremony is a good place to get other people involved in your ceremony. Parents, friends, or relatives could bring your candles to you. Some couples choose to have their mothers light the tapers and pass the candles to them. If your ceremony is in the evening, you may choose to have each member of your wedding party carry a candle. Candlelight ceremonies are considered among the most romantic. If you are blending families, you might consider having your older children join you in lighting the unity candle. Four is about the maximum number of people who can coordinate lighting one candle. If you would like to discuss involving other people in your unity candle ceremony (or any other topic), please call me at (860) 543-2334. We can discuss what represents unity best to you. Copyright © 2011 Ernest Adams All rights reserved.